In Part 1 of this blog (which you can read here), I tried to cut some of the technical jargon. We will now return to our regularly scheduled wonk. According to the final GOP tax law, New Mexicans who make, on average, more than $74,000 will receive almost 85 percent of the tax cuts in the early years (see figure below). As time progresses, however, personal income tax cuts will expire, in order to help pay for the permanent corporate income tax cuts. So while most individual taxpayers will see a tax cut beginning in 2019, their taxes will go up by about the same percentage in 2027. This will impact the bottom 60 percent of income earners, the poorest New Mexicans. 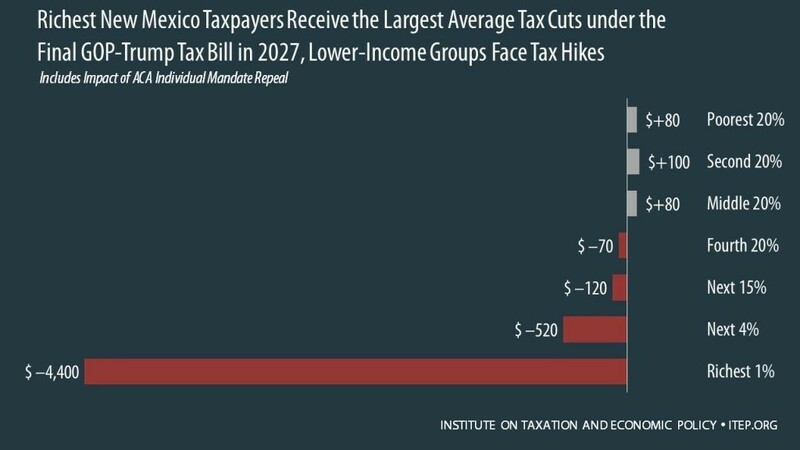 The top 40 percent of New Mexicans will not pay higher taxes in 2027 as they will still enjoy a smaller tax cut after 2027 (see figure below). 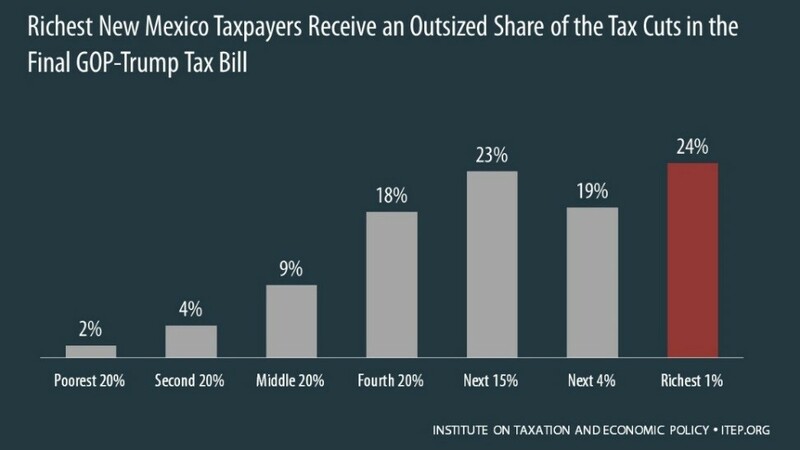 And not only are these tax cuts skewed towards wealthier New Mexicans, they also receive, as a proportion of their income, substantially larger tax cuts. 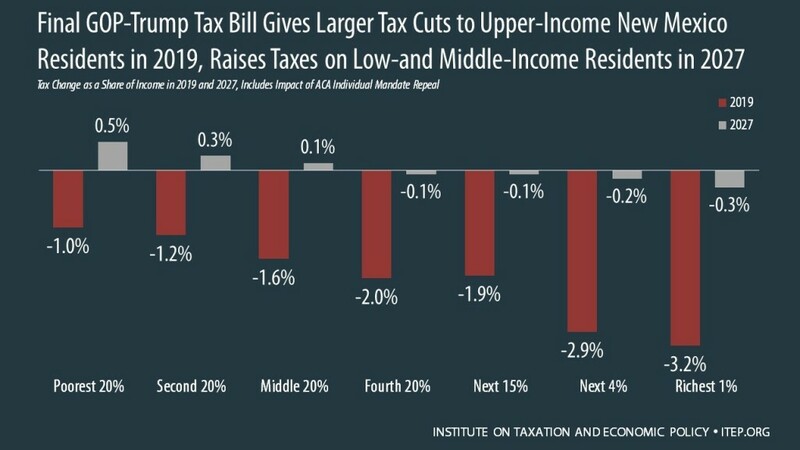 The richest New Mexico taxpayers will receive the largest average tax cuts under the GOP tax package (see figure below). 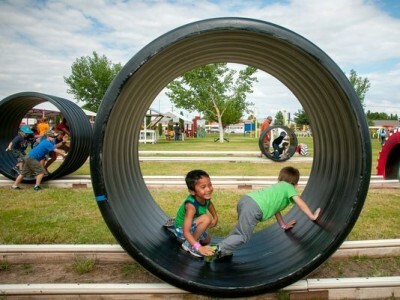 The Child Tax Credit (CTC) expansion raises the maximum CTC from $1,000 to $2,000. 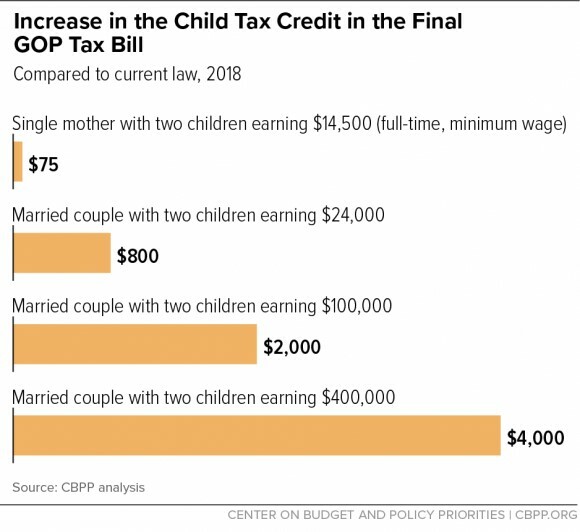 But the GOP legislation caps the increase for lower-income working families in order to enable higher-income families to qualify for the credit for the first time. For example, a family of four in New Mexico that makes $400,000 will receive a $4,000 CTC for two children ($2,000 per child). Conversely, low-income working New Mexican families, which include 91,000 children, will not receive nearly so generous a benefit. For example, a single mother in New Mexico making minimum wage with two children will only receive a token increase of $75 ($37.50 per child). This all seems pretty bleak for New Mexicans and I promise it doesn’t get much better. The next part of our series will discuss the big hole the tax plan will blow in the state budget through federal mineral lease sequestration and caps on state and local tax (SALT) payments. We will wrap up with this next section so stay tuned. Raphael Pacheco is a Research and Policy Analyst with New Mexico Voices for Children.